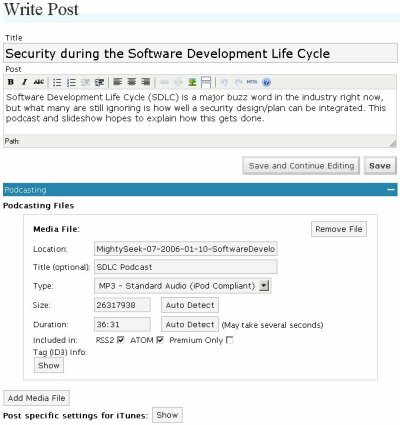 A dream plugin for Podcasters using WordPress. Podcast Download stats, with cool graphs. See below. Automatic Media player for MP3, OGG, MP4, MOV, FLV, SWF, ASF, WMV, AVI, YouTube, and more, with inline and Popup Window support. WordPress is a fantastic Blogging platform and while it does have some Podcasting support, its just all that a Podcaster could want. I searched around and found iPodCatter which is is a good start, for getting the iTunes support, but its just not a fully featured Podcasters pluggin. I then found a VERY nice Flash mp3 player that I really liked. With these two pluggins a a basis for me to learn how to write a pluggin for WordPress and for the core functionality I wanted, I created PodPress which is intended to be a full blown Podcasters Plugin for WordPress. Get it, WordPress, PodPress? Heh, I crack myself up. If you have ever installed a pluggin, then this will be pretty easy. Then it can be configured from the Options menu. The config should be pretty straight forward, and it even has a preview of what your podcast would look like on iTunes. Write a page and at the end of your Post add your mp3 filename or full URL. By adding the mp3 location after your Post it will show the player in the post, and will add the enclosure tags to your RSS2 feed.